How NOT to walk into a party! I noticed a very interesting thing at a recent singles party I was working at. The party was in full swing, but one man arrived late. on his face, that made him look like he was gurning while being attracted by bees. This was not the ideal way of making a good first impression at a party. At a singles party, many people have an eye on the door, just in case Mr or Miss Right walks in. I offered him some tips on the night and it turned out he felt awkward about being there. I thought it would be a good idea to share the advice I gave him about the right way to enter a party. 1) Just before you enter, breathe slowly to compose yourself. 2) Now walk slowly and confidently up to the doorway. 3) Imagine the doorway has a rope hanging down, that pulls you up to your full height. No slouching allowed. 4) Stand in the doorway and SMILE and pause for a couple for seconds. 5) Congratulations, you now look like somebody everyone has to talk to! Treat them mean and keep them keen? There’s one dating question I often get asked that I’m going to discuss here. When you start seeing a potential partner, is it better to pursue them or play hard to get? Time and again, people are advised to play it cool and make any potential love do all chasing. They’ll wait for them to call or text first, or keep them waiting. But studies show that this technique doesn’t work. One particular study involved a female member of a Dating agency. Her brief was that when a guy called her up to ask for a date, she would either say yes right away or pause for 3 seconds. After the call the men were told what had happened and asked for their thoughts. Playing hard to get made absolutely no difference and most men didn’t care about the pause. Another recent study took a group of men and asked if they would rather date someone keen to have a relationship, or someone who made them do all the chasing. Their conclusions were very interesting and showed that there were arguments for and against both types. The perceptions were that they thought that “easy to obtain” women were fun to be with but could be embarrassing in public. On the other hand, hard to get women were great for the ego but could be cold and unfriendly. Overwhelming research shows that the best strategy is to give the impression that you are hard to get but are still really keen on your potential partner. That’s a strategy we’d definitely recommend. Don’t agree to every suggested date and make them realise you have a full social calendar. When you make time for them they will appreciate it even more. The Single Solution were proud to sponsor the recenty party for “Loose Women’s” Jackie Brambles. 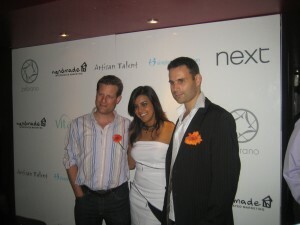 During the party James and Paul chatted to actress Pooja Shah (Eastenders, Bend it Like Beckham) who turned out to be a fan of Asian Single Solution! Is their ex getting in your way? 1) Communicate. If their ex is getting in the way then you need to talk things through before problems build up. Find out what went wrong and what caused them to break up. Make sure there are no feelings left or questions unresolved. If you are worried about them getting in the way then it’s up to your partner to reassure you, not the other way around. 2) Give them Space. Let them meet every now and again if they are friends. They are entitled to have their own friends and they must at some point have had lots in common. If they feel like you are pressurizing them, they might panic and become defensive, which will cause tensions and arguments. 3) Don’t display signs of jealousy. Even if you are, then never ever let her know. Instead, be overfriendly with her and show her how happy you are with your partner. Always smile, laugh at his jokes, hold his hand and show her you are completely non-threatened by her. 4) Don’t compete. Keep in mind that you’ve already won as he’s chosen to be romantically involved with you. So don’t feel you have to outdo her or fall into the trap of constantly comparing yourself to her. It’s you that he wants to be with so it’s game over for her. 5) Don’t try and make him jealous or her angry. It can be tempting to flirt with other guys or try and wind her up, but game playing will only backfire on you. There’s no need to create barriers or problems if they don’t exist in the first place. 6) Get to know her – you might just make a new friend. You never know, she might even be more worried about what you are thinking than the other way round. At least if you know her and how she thinks then you have the strong advantage. 7) Make sure you have a wide social circle yourself. That way you have other people to talk to and aren’t dependent on your partner. He’ll know that you have other options and places to go to, which will make him realise life goes on without him. 8) Be cautious. If there are three of you in the relationship and she’s causing problems then take action. Just because he’s happy with you, doesn’t mean she doesn’t want him back. Watch out for warning signals like secret text and phone calls, him wearing clothes she likes or him simply disappearing. 9) Trust him. It can be hard, but it’s only through trust that a relationship can develop. Take his word that they are just friendsâ€¦.at least until something happens that makes you doubt otherwise! 10) Give it time. It might be an annoyance or inconvenience but don’t worry. She will eventually meet someone else and will be off the radar and out of your life. You don’t have to deal with her forever!